Defending Israel, PEN says it can't support 'cultural boycotts of any kind' -- but it does! Defending Israel, PEN says it can’t support ‘cultural boycotts of any kind’ — but it does! In fact, in March, when the fight began, PEN’s World Voices leaders, Colm Toibin and Jakab Orsos, issued a grandiloquent statement saying PEN is against boycott as a tool. When confronted with nuanced and complex issues, PEN and PWVF must always fall on the side of maximum protections for free expression. With that guiding principle in mind, PEN does not and cannot subscribe to cultural boycotts of any kind—which impede individual free expression—no matter the cause. Note that Nossel once mocked Dubai for its support for the Arab boycott of Israel. And recall that Nossel helped quash the Goldstone Report when she was an official at the State Department, and bear in mind the bigger picture, the importance of pro-Israel Jewish money to an organization like PEN, the same donors who support liberal and arts organizations also fund congressional trips to Israel for AIPAC. We are writing to you as members of the Sport for Rights campaign, which has been working to raise human rights violations in Azerbaijan in the run-up to the Formula One European Grand Prix. We are deeply disappointed by your decision to perform in Baku on 18 June in connection with the European Grand Prix, given the dire human rights situation in the country. We urge you to take a stand for human rights in Azerbaijan and cancel your Baku performance. We have observed your support for charitable causes, including Save the Children, which advocates the promotion and protection of human rights. Unfortunately, the human rights of the people of Azerbaijan have not been respected or protected. Although 16 political prisoners were recently released, dozens still languish in Azerbaijani jails, including journalists, bloggers, youth activists, politicians, and religious followers guilty of nothing more than disagreeing with the government. Despite the fact that they never should have spent a single day in jail, the released prisoners have not been rehabilitated, still under legal restrictions that impede their work and their lives, with some facing travel bans preventing them from accessing urgently needed medical attention. More broadly, civil society is attempting to work in nearly impossible conditions, and a number of NGOs face politically motivated criminal investigations. Journalists operate in a climate of fear, in a media environment dominated by the state, where violent attacks – even murders – against critical voices are committed with impunity. As with previous prestige events, the Azerbaijani authorities are using the European Grand Prix in an attempt to whitewash their image, to distract international attention from the human rights abuses taking place in the country. Whether or not it is your intention, your performance would be used as part of that cover-up, as propaganda for an increasingly authoritarian government. A performance in Azerbaijan would serve to further the suffering of the country’s political prisoners, and the many others whose rights have been violated by the very government that will profit from the European Grand Prix. But you still have the chance to make this right. We urge you to cancel your Baku performance, and to speak out publicly, condemning the human rights crackdown in Azerbaijan, and calling for the immediate and unconditional release of political prisoners. We call your attention to comments made by U2 lead singer Bono on stage in Montreal last June, on the night of the opening ceremony of the European Games in Baku. Bono specifically named six Azerbaijani political prisoners, displayed their photos in the arena, and conveyed a message to President Aliyev: “If anything happens to one of our friends, we will hold you responsible!” Five of the prisoners he named have since been released. We believe that you taking a strong stand for human rights could also have a significant impact. Good Lord, why the pretense that PEN is actually an NGO? PEN is a US controlled GNGO (government non-government organization) and Suzanne Nossel is a Judeo-Zionist imperialist who favors imperial intervention. Why pretend otherwise, or that PEN’s policies are merely hypocrisy rather than imperial realpolitik? Boycott Israel? Dream on. I am a Jew, a Zionist, and a Disraelian imperialist on behalf of her majesty the Queen. The world was a more decent place under the British Empire, and America’s main problem is that after dismantling the British Empire, she didn’t replace it with an American one (imperialism is most of all a consideration of administration and expansion, and doing it well means spending money. “But self-government, in my opinion, when it was conceded, ought to have been conceded as a part of a great policy of imperial consolidation. It ought to have been accompanied by an imperial tariff, by securities for the people of England for the enjoyment of unappropriated lands which belonged to the sovereign as their trustee, and by a military code which should have precisely defined the means and the responsibilities by which the colonies should be defended, and by which, if necessary, this country should call for aid from the colonies themselves. It ought, further, to have been accompanied by the institution of some representative council in the metropolis, which would have brought the colonies into constant and continuous relations with the home government. All this, however, was omitted because those who advised that policy – and I believe their convictions were sincere – looked upon the colonies of England, looked upon our connection with India, as a burden upon this country, viewing everything in a financial aspect, and totally passing by those moral and political considerations which make nations great, and by the influence of which alone men are distinguished from animals. Really? Well, then, patsh zich in tuchis und schrei “hooray”! Even Disraeli will get confused though he may not dislike the resurrection of his name at the service for a bygone Majesty and at the service of a crumbling one who would have crumbled much earlier had it chosen to follow the advice of Disraeli or the footsteps of Britain . He’s very ‘neggytive’ about the Nakba. Pip pip, cheerio, Neggy old chap. As for “The world was a more decent place under the British Empire”, I cannot help but think that depends entirely on whether or not a person, or group, was on “the receiving end”, so to speak, of the British Empire. If you type these four words “England Africa concentration camps” in to Google Images, you might be a bit surprised at the photos. And what they seem to resemble. You’re saying, in effect, that Palestine was better ruled under the British and that the creation of Israel (by Zionist anti-British violence, among other things) was a big mistake. Interesting. You expected anything else? Amerikkka has is nose so far up israhel’s tachat you can’t tell where one ends and the other begins. Americans are not free. I may not say this right because it kinda contrarian but BDS may be having a good, constructive, sneaky, backdoor, inexorable, environmental, osmotic effect that will eventually envelope Israel. Because so many of the Nossels and her pro-Israel funders are personally and painfully affected by BDS targeting Israel, their BDS-induced sense of discomfort and external compulsion instructs them to use the tactic everywhere THEY can. They’re adopting and legitimizing BDS as a universal tactic because they’re just so darn pissed off that it’s being used on them, and maybe/hopefully without sensing they are doing so. It’s then only a matter of time before this, by then, perfected political tactic is accepted by EVERYONE for use on Israel. This could be like the movie “Ghostbusters” where Israel chooses (is choosing) and strengthens the method of its own ultimate compulsion. 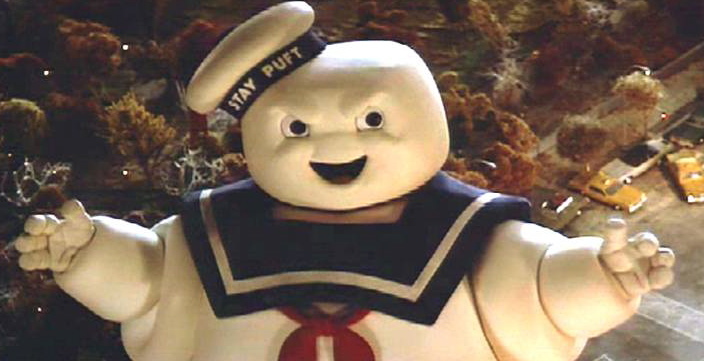 BDS could be Israel’s very own giant Sta-Puft Marshmallow Man. The gap between the 2 pieces of the forked tongues allows the cognitive dissonance ( Iran vs Israel, Azerbaijan vs Israel ) to germinate and pass unnoticed . If you challenge the indoctrinated lady, she would remind you of the phrase : No Moral Equivalency between the two- so successfully used umpteenth times by the neocons. Of course there’s a double standard, because Israel is the specialest snowflake in the Mideast, if not the world. You are “all three” and still single? Unfair treatment of Israel has always really meant the removal of special privilege and exception for Israel. Just as they fear justice and accountability, just as they fear legal action, they fear equal treatment with other countries. Any other country would have been dealt with long before this. No more special privilege for Israel. Their inhuman treatment of others removes any entitlement that they have been given in the past.